There are so many vegetables available at the market these days - vegetables we tend to be a little less familiar with. Today, I want to focus on beets. 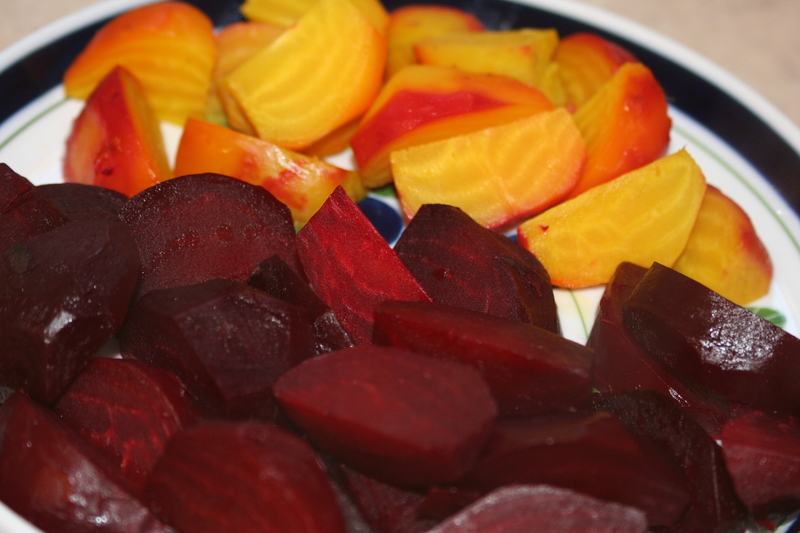 Red beets seem to be the most common in the supermarket but yellow/golden beets are delicious as well. Beets are a root vegetable but the entire vegetable is edible - the greens are actually my favorite of all the greens. I love beets and I always have but my husband isn't crazy about them. I can't remember if my kids have had them before but all three of them ate the beets without complaining and a couple of the boys liked them very well. The recipe I made even had my husband admitting that they were pretty good! Here are the red and yellow beets washed, trimmed*, drizzled with olive oil, wrapped in aluminum foil, and ready for the oven. Bake them at 375 degrees for about 1 hour or until tender. Then cool until they can be handled and peel them. I actually enjoy them straight from the oven just like that with maybe a little butter and salt. For the recipe, cut them in wedges - 6 or 8 per beet. The recipe below is in my top favorite salads ever. It is SO good - a bite with a little bit of everything has the perfect textures and wonderful flavor. Whisk the vinegar, red onion, and honey in a medium bowl to blend. Gradually whisk in the oil. Arrange mixed greens on 4 plates and dress with a little of the dressing. Top with the walnuts and cranberries. Season the salad, to taste, with salt and pepper. 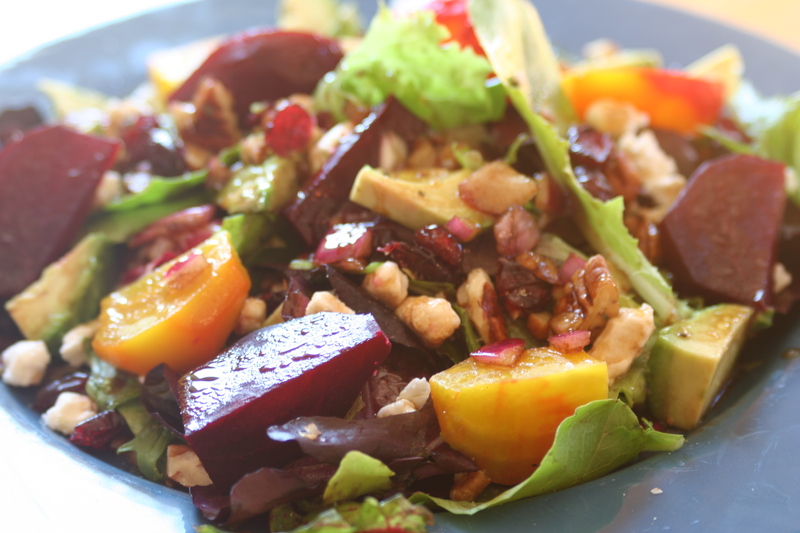 Arrange the beets and avocado around the salad. Top with the goat cheese, dress with more vinagrette and serve. As I mentioned the greens are outstanding. I like to saute mine in a little butter and olive oil and top them with a little balsamic vinegar and salt. They are also great with a little garlic! Delicious! 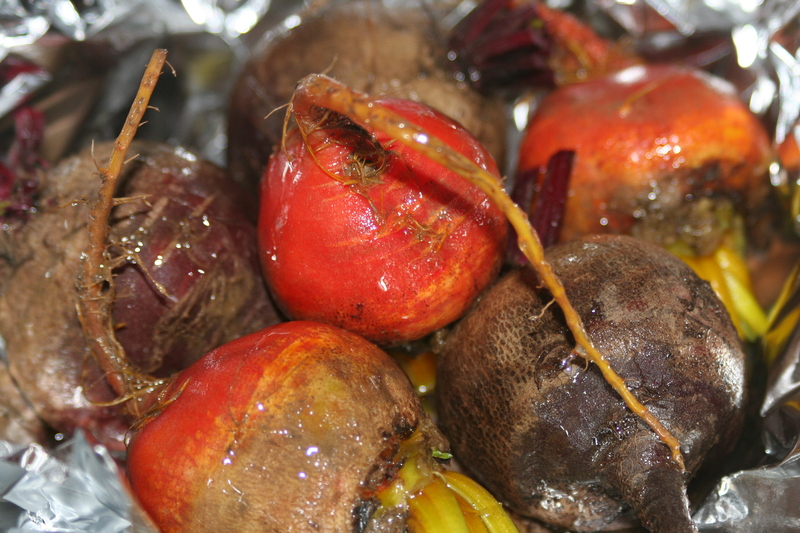 *A final note - leaving the beets with the peel and the top and bottoms intact when you are roasting them minimizes the color bleeding out of the beets. If you are boiling them (which also works well), still just trim off the greens and then drop them in the pot with the peels, tops, and bottoms still in place. I wish I liked beets. All the times I've tried them, I really just don't. 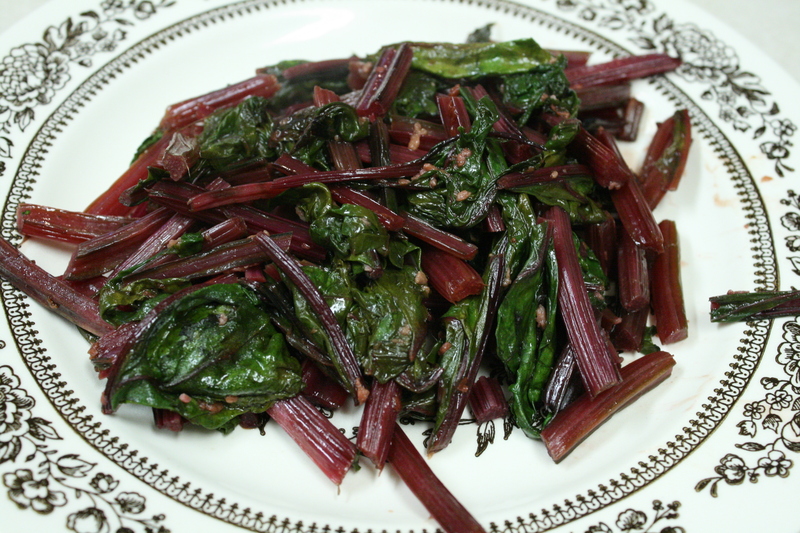 I have eaten and enjoyed beet greens, though. I guess that's something, right? I am definately going to try this beet recipe. My grandparents ate beets alot. Because beets have a strong taste I have only tried them pickled and eat them only a few times a year. I have juiced them but you must use them sparingly in juicing. I have never eaten the greens, however.